Il campeggio Camping La Roche-Posay Vacances è dotato di 200 piazzole itineranti. In bassa stagione, nel periodo 06-04-2019 - 29-06-2019 e 01-09-2019 - 21-09-2019, è possibile soggiornare a soli €18,- a notte in una delle 200 piazzole itineranti del Campeggio La Roche-Posay Vacances di La Roche-Posay (Vienne). Oltre ad offrire prezzi vantaggiosi ai titolari della CampingCard ACSI, il campeggio accetta anche l'ACSI Club ID (sostitutivo del documento di identità). Tranquillo camping sul fiume Creuse a 1,5 km dal paese. Grandi piazzole suddivise da alberi. Piscina coperta riscaldata in funzione per tutta la stagione. Our visit to this site was marred by exceptionally bad weather throughout France with floods in many areas including the Creuze Valley. The site is large with many mobile homes but still many touring pitches of various sizes and shapes with a few hard standing pitches for motorhomes. Much of the site has a heavy canopy of trees which means that when the ground is very wet it takes a long time for it to dry out. At the time of our visit the grass had not been cut or hedges and trees trimmed - perhaps because of the bad weather. A lot of itinerant workers were staying on the site in their caravans and parked their cars on adjacent pitches, frequently moving them and carving up the very muddy pitches and site roads. There are 2 sanitation blocks, the larger one being the most modern and was kept clean but unfortunately got quite dirty quickly despite few campers on site. Copious hot water and showers of a decent size - notices not to wear shoes in the shower areas were ignored unfortunately. However this could be and probably is a good site when the weather is fine and dry. There is a restaurant on site (not open when we were there) as well as a very good swimming pool complex and sports areas and a very good reception building. One thing that was a concern was the electrical installation to the EHU's I found quite a few insecure sockets on the EHU posts and two that when you tried to plug into had no fixings at all and came away from the post with only the single core wiring connected to the sockets holding it in place. Excellent family run site, a warm welcome was received from John and Angela, nothing was to much trouble, there are a great choice of flat pitches shaded or sunny, the snack bar has an very good menu, the food was well prepared and tasty. 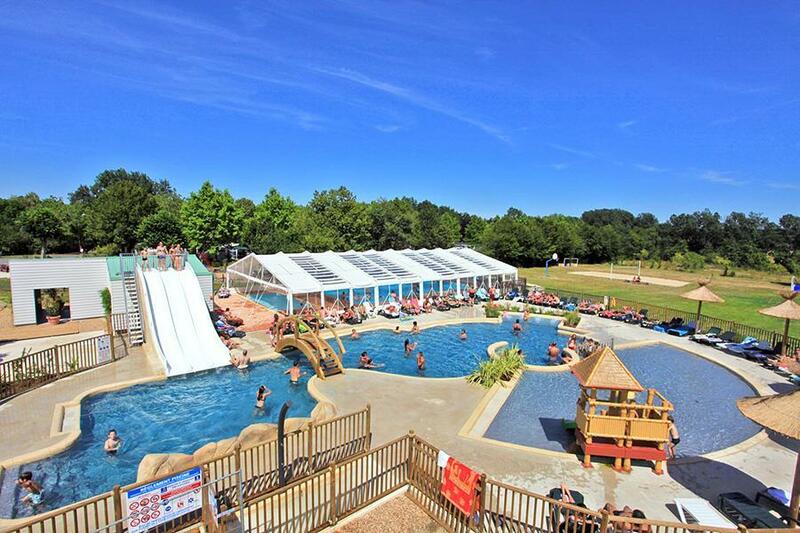 The choice of pools were some of the best we have used in France, we would recommend this site to couples and families alike, the town is also attractive,shuttle bus provided and for convenience a Super U is only 5 mins by bike, overall a brilliant site, with English spoken. We have stayed at this site every year for the last 10 years. We met the new owners last May. It was really helpful that the new owners are French / English ( great as we don't speak any French ). The plots are a good size, with easy access and 10 amp electric.They have been very busy since our last visit, the 2 new swimming pools are complete: one has a cover over it, the outdoor pool has a slide and Spar Jets. They have almost completed the new area that will accommodate the new reception, shop, restaurant, outdoor area and children's play area. This is an excellent site, we look forward to next year. Lovely site, well kept with really friendly staff (French/British couple). Great pitches with hedges! Volete prenotare il campeggio Campeggio La Roche-Posay Vacances o oppure saperne di più? Potete farlo usando i seguenti dati oppure tramite il sito del campeggio. A10 uscita 26 Châtellerault-Nord (km 273). Seguire segnaletica per La Roche-Posay. Poi D275 per La Roche-Posay. Alla rotatoria seguire cartelli camping-hippodrome. CampingCard ACSI invia la tua richiesta di informazioni al "Campeggio La Roche-Posay Vacances".